Once again Monaco proves itself as a great venue for F1 racing, admittedly with the assistance of a rainy day. So much incident, disaster, triumph and drama was packed into this year's race that it was easily the best of the year so far. And suddenly the detractors have melted away, those who say the Monaco GP is boring, that passing is impossible, that it is no more than a hugely expensive parade for the glitterati, all carping made ridiculous by such a race as Sunday's. Monaco is the GP that rewards the driver who can maintain concentration and, when it rains, that becomes doubly so. There are moments when a driver can be robbed of his rightful reward through another's clumsiness but that is true of any race. Adrian Sutil's unhappy departure was more cruel than most, though, and it is understandable, if silly, that his incident with Raikkonen should be examined so closely afterwards. We all wanted Adrian to keep that fourth place and our anger was directed more at fate than anything else. Kimi's loss of control as the cars swooped down to the chicane was uncharacteristic, to say the least. Theories of braking too early or too late abound but it seems to me that it was much more a case of a little too much pressure on the pedal, rather than a matter of timing. The back of the car stepped out - and that means the rears locked, however briefly. 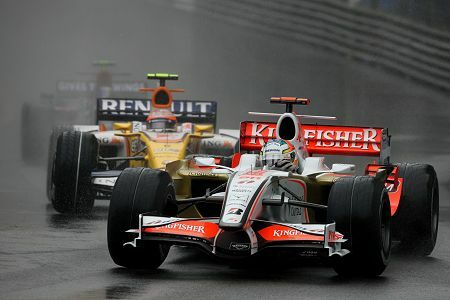 And, once the car was out of shape like that, the over-corrections that sent Kimi helplessly into Sutil were inevitable. It was a racing incident, that's all. I confess to being a little amused by the Ferrari fortunes in this race, however. As I have written previously, we see Raikkonen as the man who should revel in the absence of traction control and our suspicion is that Felipe Massa will not cope, especially in the wet. How ironic is it then that it should be Felipe who kept everything together (well, okay, he overcooked it once, slightly) while the master lost it so ignominiously? F1 makes fools of us all sometimes. That one Massa error prevents his joining the elite band who truly mastered Monaco this time. In that category we have to place the previously-mentioned Sutil and the amazing Robert Kubica. Both were very quick in cars that were not the best and both rode that fine edge between success and disaster throughout. The points may have eluded Sutil in the end but his reputation must bounce back now from the depression of his season to date. Kubica was brilliant, hounding Massa and taking his chances when offered. He does seem to like the BMW F1.08 as much as Nick Heidfeld hates it. And, having failed to get the car as he wanted, poor Nick had to suffer a series of thumps and bad luck as others tried to take him out. It was a race he will want to forget. As for Lewis Hamilton, he had all the luck going, even his unscheduled pit stop somehow fitting into a strategy that turned out right in the long run. He was fast, yes, but it was just as much McLaren's flexibility in strategy that earned him the win. It helped, too, that Ferrari were tripping over themselves at the same time. Others who deserve mention are Sebastian Vettel, who took the new Toro Rosso to fifth through consistent speed and allowing others to drop out, Mark Webber, who was excellent all day, and the unnoticed Kazuki Nakajima, who kept plugging away and stayed in the race while his fancied team mate crashed out. The rest were entertaining at least, as they demonstrated the myriads of ways to break a F1 car around Monaco, the Toyota drivers in particular excelling at this game. But it was not the huge disaster that some had predicted for a TC-less wet race; only six retirements is not bad for Monaco and we should notice that most incidents led merely to the minor result of a new nose being required. Traction control may prevent large numbers of accidents but the big ones happen with or without it. It was a great race though, wasn't it? All the action we could possibly ask for and a non-Ferrari winner at the end. The championship is revitalized and we go forward to Canada still undecided as to whether Kimi will easily pocket another championship or someone else unexpectedly steal it. Massa showed that he has achieved a level of consistency and put the silly mistakes behind him, and Kimi showed that he hasn't, just like last year. I think Kimi is just raw talent, like Montoya, and I wonder whether adaptability takes a back seat in those cases. I think Massa will continue to make the occasional mistake, usually through trying too hard - but so will Raikkonen, except that his will be through his attention wandering. Both Alonso and Hamilton, perhaps with the additions of Kubica and Rosberg, are already better drivers than the Ferrari pair, if you ask me. I'd have to say you're right about those others you listed as being better than the Ferrari pair. Raikkonen more for me right now. Massa is turning his season around and Raikkonen seems to be going backwards. I would go out on a limb and say that given the Ferrari to drive, Kubica would beat Raikkonen. That said, I think Raikkonen will turn things around and get on track. Luck plays a large role in a wet Monaco and Kimi was less lucky than Lewis; after all, Lewis's suspension could so easily have been damaged along with the tyre. And the drive-through penalty - of the team's, not Kimi's making - won't happen again. Ferrari’s mistakes made Hamilton look good and handed him the race. With two thirds of the championship to come and both Ferraris only a few points behind, Lewis will need a lot more of his Monaco luck to hold them off. Having said that, he drove a more solid race than anyone else and earned the win. I can't say I fully agree about Kubica and Rosberg. I am a fan of both, but Kimi has the edge of experience. You have to admit, the way he turned his season around last year was pretty impressive. But I do think he is someone who has perhaps peaked. I don't think he's a driver who thinks he needs to improve in any way, whereas the other drivers are on a learning curve. Perhaps even Alonso will learn from driving a relatively uncompetitive car. Kimi, like Montoya, and to a certain degree Alonso, is like an on/off switch. He's either the best of the day or mid-field. The question is: can he string enough best-of-the-day's together to win a championship. The youngsters dominated Monoco. Sutil, Kubica, and Hamilton put on a clinic of how3 to drive in the wet. Kimi surprised how poorly he did. Too much brake petal? Maybe, how about the wrong brake bias with too much on the rear? Green Flag: Yup, Monaco is a race where luck has a huge influence and rain makes it even more so. I think Kimi and Lewis had about equal amounts of good luck in that their mistakes were not terminal but Kimi was also handicapped by his team. The man who drove flawlessly was Kubica, however. Arnet: I have to disagree with you about Alonso - I think he is unlike Kimi in that he gives his best at every race. He makes mistakes occasionally but everyone does that. I don't like him but have to admit he can drive. It was a great race, and I do think that Kubica was the driver of the day, in that he did not put a foot wrong once, and certainly out of the three on the podium, had the slowest car. He may be a future master of Monaco. But certainly Sutil did a fantastic job, and I nearly cried when Kimi took him out. For sure (there's that phrase again !) it was a racing incident, but oh, so cruel. As for Massa, well he has done a LOT better than I thought he would this year (so far). But I just can't seem to make the quantum leap in my head to see him as WDC material. Who now to Lead the Way? Kimi drove poorly when we should have seen him take to the front and show the opposition what Driving really is. Masa was simply serene. Lewis was dashed lucky to adopt (on the fly) tactics that suited the field. However he did drive well given the conditions and deserves no mean criticism. I have to agree that Alonso is not liked by me either, but as you say - he can Drive. All the above written just after watching a TV documentary on Graham Hill (5 times winner at Monaco) and ruminating on days when 'racing' meant just that. While this years race did not have the same thrill that earlier years may have provided; it will do. I think the championship is a toss up between Hamilton and Raikkonen although right now Lewis is probably favourite because he has a huge gap to his team mate and is therefore more likely to benefit from a clear number two earlier than Kimi. Massa is driving well bu despite all the hype he is still behind Kimi in the championship. I don't understand how he beat Kimi at Monaco but I think most of the Ferrari tracks will suit Kimi more than Felipe. Historically on the tracks that suit Massa, Raikkonen is close behind him whereas on tracks that suit Kimi Felipe tends to be further back. I don't think there is enough evidence yet to say that either Kubica or Raikkonen is better than Raikkonen. I would still take Kimi over either of the others. Although I think long term Rosberg may be the best of the three. Clive, I must remind you of Canada last year when Alonso spent almost as much time mowing the lawn as he spent on track. I agree that he is brilliant, and on a good day he's great, but I think there may be a bit of mental fragility there, as we witnessed by his reaction to his situation in the McLaren team. If he's not on, mentally or emotionally, then he won't have a world-class race. I think he needs to have so many elements right for it to work. On the other hand, I don't think Kimi will be bothered by a team-mate. He just shows up and trusts his talent. Period. Sometimes it works, sometimes it doesn't. I think Montoya was more of a mix of both. Good point about Canada, Arnet. I do think that was the only race where Alonso allowed the pressure to get to him, however. Otherwise last year, it was remarkable how he seemed to put thoughts of what was going on in the team out of his mind as soon as he got into the car. Kimi is probably even cooler but he does vary greatly in his enthusiasm, it seems. It really does look as though he doesn't care as much about F1 as the other drivers do. I think he cares a lot when he's winning and is bored when he's not. It's all about the fun for him, and for others it's their life. I really can see him walking away if he doesn't have a winning car. A bit ADD in his application, I suppose. I think there's a problem with the photo. The caption says Sutil, but that's definitely Fisichella holding off Alonso. I can see why the confusion - Fisi had a different helmet on at Monaco which had a completely different colour scheme to usual (a gold-and-black number). Sutil had his usual red, blue and yellow helmet. Raikkonen's probably the best driver on the grid, but only when he's having a good day and is interested. Sunday clearly wasn't, which is why several other drivers looked better. Why Monaco should have been the scene of a "bad day" is a mystery. Still wouldn't write him off though. Hey, you're right about the photo, Alianora! I'll fix that (or put a different photo in). As you say, Fizzy's change of helmet colours caught me out - I wish the drivers would get over this modern habit of changing their helmets for every obscure statistical event. As for Raikkonen, I've had enough. For years I've supported him and too often been disappointed - Monaco was the last straw (and not because of the Sutil crash, which was a very minor error that turned out badly - he was just poor throughout the race). It's time to admit that consistency is every bit as important as occasional speed and there are drivers out there who are just as quick as Kimi anyway. The rumours of his pending retirement from the sport gather force and it looks to me as thought they're true. Alonso in a Ferrari in 2010.
yes Clive,Monaco 2008 was a classic,won by the sun shine kid as for Kimi and Sutil,ofcourse it was an accident...why would Kimi take himself out? we all feel sorry for Sutil and Force India but this way they got a lot more publicity! Hamilton seems to be fast becoming the new rainmaster... his racecraft seems to be on another level compared to the rest, that's for sure now. Kimi has always failed under pressure - he needs a lot of safety margin tp prevent mistakes slipping in. The was he lost control of his car and smashed into A Sutil was to put it bluntly, pathetic. Massa to me has always been the slightly stronger driver - Kimi never lived up to his billing to date. Can't see Kubica going to Ferrari, Mule - he'll stick with BMW, I reckon. The Alonso rumors look more likely to me. Clive, I have so enjoyed reading the comments on your excellent blog, great, informed and thoughtful. Did anyone else notice that Kimi's tank slapper and D.C.'s practise off happened in exactly the same place and both involved a lurch to the right under braking? Apparently Hamilton had a right rear puncture which would have affected his race if it had gone the full distance, but if it came from the debris after the Rosberg crash, the one that cost Lewis his 38 second lead and which would have given him time to pit and still lead the race...... my brain hurts!